[The scale is in mm.] The adult chrysomelid shown here was collected 1 mile west of Charleston, Coles County, Illinois, 6 June, 2008, as a leaf-mining larva on western sunflower, Helianthus occidentalis; the adult emerged and was photographed on 20 June, 2008. It is from the same series, and is the same species, as the larva shown along with its leaf mine in BugGuide photo # 188653. Thanks for any help with an identification of this beetle. It's a Microrhopala sp. I'll dig out the latest revision of the hispines and give a closer ID. Nice to have the host plant known. That will help out tremendously. The host plant places it as M. rileyi but it keys out to M. vittata (at least as far as I can ascertain - not being able to see the frons of the head keeps me from being certain). The lack of orange elytral and pronotal markings is puzzling as is the host (vittata normally feeds on Solidago). 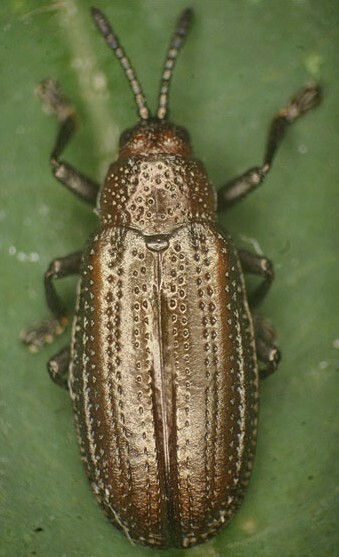 The bronze metallic coloration is also unusual for vittata as the dark areas when metallic are usually bluish. I would not be surprised if it is a new species. You might want to contact Dr. Staines in Gainesville, Florida (FSCA) as he is the hispine expert. ...when I pull up the FSCA list of entomologists (http://www.fsca-dpi.org/OverviewFrame.htm), I don't see him listed anywhere there. Apparently he previously was at the USNMNH, and I found an e-mail address for him at that institution, but it's a dead address. I give up. Too bad he'll never see this beetle and the associated mature larva. Try the Virginia Museum of Natural History as that is where the book was published. There are two ways of following up: either visit the website at www.vmnh.net or call (276) 666-8600. Good luck! "The specimen is Microrhopla vittata (Fabricius). The species is fairly varibale in coloration with specimens from different host plants having different color patterns which has led to a number of synonyms." I think. congrats for raising it successfully, great photo, too! Thanks very much for your ID and comments! I have no idea what you have here. I just thought I would help you out with a link. If want, you can link both pictures. Under your initial comment you should see the "tag" link. Click it and you will notice a thumbnail on the left side on the page. Go to the other image and do the same. Under both of the thumbnails on the left, you should see "link". Click it and both images will then show a thumbnail link to the other image. So probably best not to link them. Your thumbnail should be all the cross-reference needed. after first reading it that this adult emerged from that larva. Sorry. Thanks, Ron, for your suggestion to link the images. I will abide by Chuck's recommendation that the images not be linked because they do not represent the same individual. Here is some additional background info on this rearing. The two leaf mines that produced the larva in the one picture, and the adult in the other, were identical in form (as were the larvae, from what I could see by back-lighting the mines) and were on adjacent leaves of the same plant of H. occidentalis, with no other mines present in the stand of plants from which they were collected. Given this dispersion pattern, and the fact that both hostplant preference and form of leaf mine tend to be species specific in leaf-mining insects, it is most probable that the two larvae were conspecific, in that they were siblings resulting from a single oviposition event. The alternative prospect (not conspecific) requires that adult female chrysomelids of two different species came to the same H. occidentalis plant at the same time and each laid one egg, with their respective larvae making identical leaf mines and developing along the same time schedule. That of course is possible, but it seems vanishingly unlikely. Thanks, both Ron and Chuck, for taking the time to provide input on this.